Palm's forthcoming Pre continues to create a media storm prior to its launch, and an errant Twitterer has revealed details of a huge campaign between Facebook and the Pre. Jaime Gonzalez, a photographer and filmmaker, was at the Warner Bros. film studios recently snapping for the forthcoming tie in, which appears to be some kind of 'we're in the desert, we're still connected' riff. The sleuthy snapper then took a picture of the set and tweeted it with a message: "Back at Warner Bros! Palm Pre in the house... It's the iPhone for chicks! LOL". The page has since been taken down, which can only fan the flames of speculation over such an event. 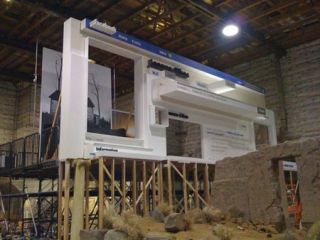 Plus, we love the lifesize Facebook set that's been built, although why it couldn't have been done with CG we don't know. Guess we'll have to wait for the advert. In a bid to out-Apple the iPhone in terms of hype before release, the world is also lapping up a few more morsels of functionality on the subject of the Pre, thanks to the leaking blogger at the Inside Sprint Now site. According to his responses, the Pre will have full Office 2007 compatibility, will soon have support for PictBridge for sending photos, and while there's no video recording capability, that's coming soon too. Check out the full list of responses over at the site, where you can even ask the Pre questions you're dying to have answered.